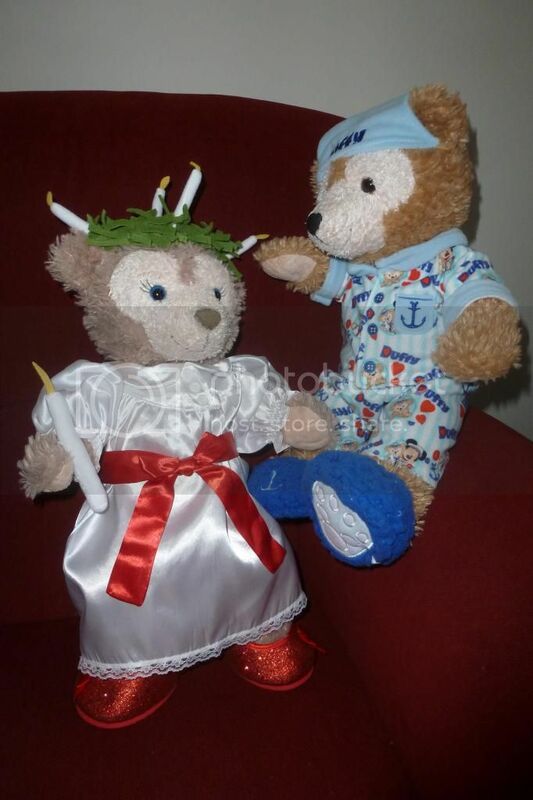 Happy St. Lucia Day! This is a Scandinavian holiday. My sister got the outfit for Shellie May last Christmas. It is from the Build-A-Bear across the street from the Tivoli Gardens in Denmark! 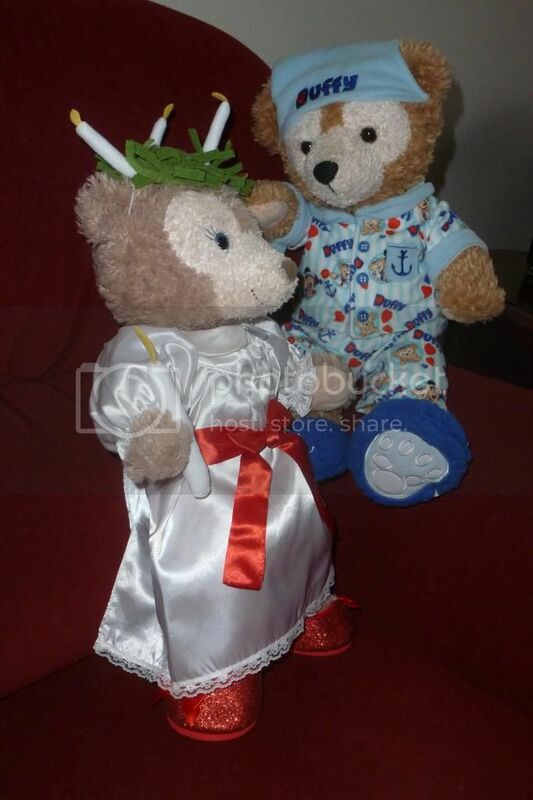 "You look really pretty and I know you like dressing up," said Duffy. 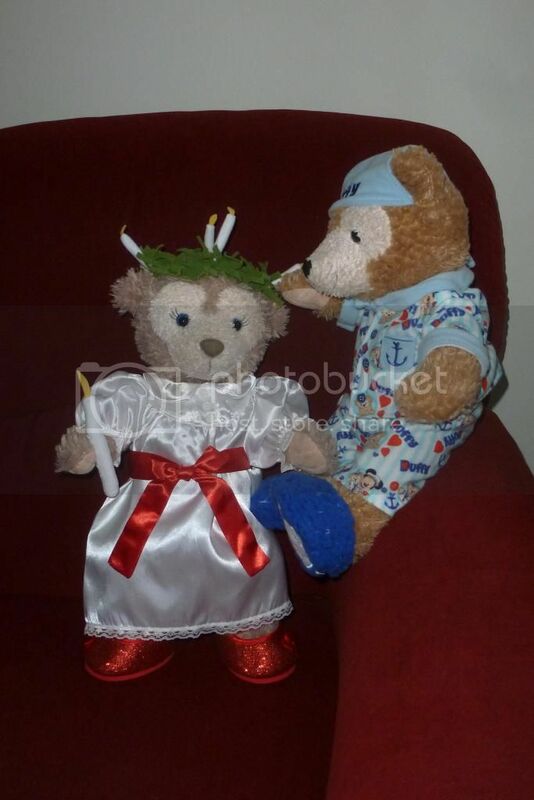 "But those candles on your head wreath are pretty funny," he said, touching one. "You wanna know what's REALLY funny?" asked Shellie May. "YOU still wearing the same pajamas!" said Shellie May. "Tee hee, gotcha," she ended playfully. Duffy chalked up one point for her with his paw. That's adorable, JillT! It's neat to see unique BaB offerings from other countries. Thank you guys for your input. We had a great and rain free trip at Disney World. This is how Duffy spent his time in the parks looking. I covered the horn with the hat and took off the shoes. I thought the suggestions were good ones. In all my time taking Duffy around places I have NEVER gotten so many compliments in my life about what he was wearing. People were whispering (not so quietly) to each other how cute he looked, people were coming up to me asking where to get the entire look, and cast members lost their minds when they saw him. The entire store at the Italian pavilion ran over to take pictures with Duffy. I had brought three sets of clothes for Duffy to wear on our trip but I kept him in the same outfit as it went over super well. 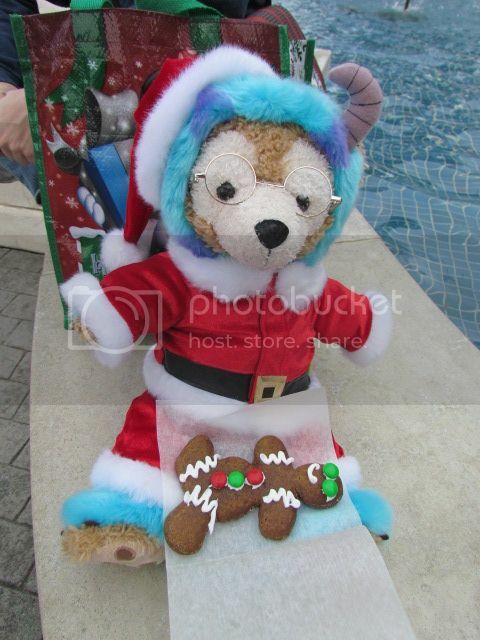 XD Duffy was very popular this Christmas trip. People love da bears, I'm happy for you Tenchikiss! For some reason those glasses look especially cute on your Duffy. My Duffy only needs them for reading. When my bears wore their Mickey & Minnie outfits when we went to Epcot earlier this year (my last visit before my AP expired), I had SO many people come up asking where I got their clothes. Your Esty shop got a LOT of a referrals from me that day! I only like the games on Disney Infinity, not the toybox mode, so since they are just doing characters and setting people loose to create stuff, I'm neither good at creating nor enjoy playing other people's creations, I got tired of that phase really quickly. What is your shop named on Etsy? Have I purchased from you? I absolutely adore all the photos that have been posted. I've been wanting to do this for a year but just now finally did it...merry Christmas! That's an adorable wreath Eeee-va. And Shellie May is cute as always in her holiday finery. 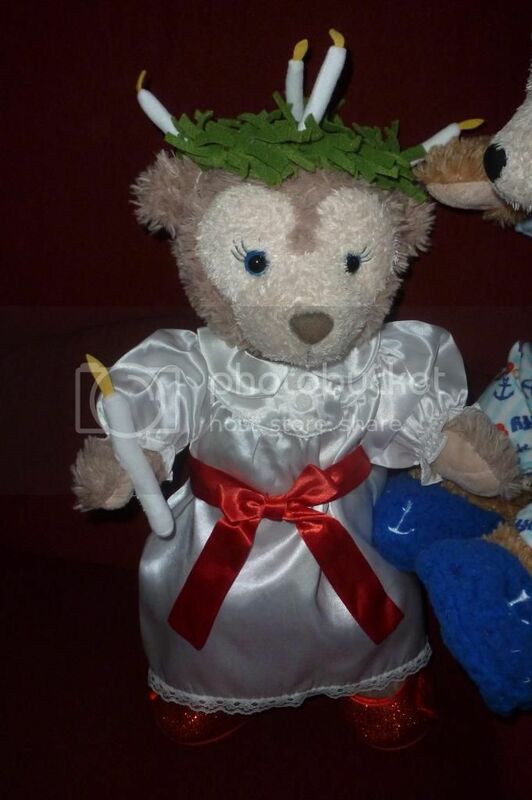 I just might have to make my own Duffy wreath next year. Very cute wreath Eeee-va. I also adore Shellie May's outfit. Her shop is called That's Sew Amanda (used to be called DSM Clothier). That's an awesome toy for Duffy, Aimster. I've been meaning to post more pictures from my trip, but I'm neck deep in sewing (again!). I'm a real glutton for punishment. Well we've added a new member to the family, PackTrick, but Duffy has been a little frustrated at his new friend. that is funny! I didn't notice that it was a back Pack(Trick) at first and wondered what you did to that poor bear. Omigosh, immamouse! That's beautiful! Also, your avatar — did you paint that?